In response to growing public demand, Lick Observatory has increased the number of evening events for visitors in 2018, adding 20 public evening tours to enable more visitors to enjoy the observatory after dark. The four- to six-hour expert-guided walking tours were introduced in 2017 and resonated very well with participants. 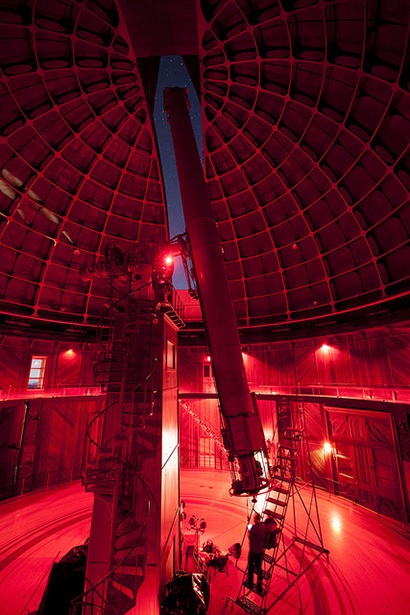 Lick Observatory’s annual summer visitors program also features live music, evening lectures by world-renowned astronomers, and opportunities for the public to view celestial objects through two historic telescopes: the 36-inch Great Refractor and the Anna L. Nickel 40-inch Reflector. Tickets to the Annual Summer Series and the walking tours tend to sell extremely quickly and will be available online at www.ucsctickets.com, starting promptly at noon on Wednesday, April 18. The musical line-up in 2018 includes Black Cedar, performing classical music with flute, cello, and guitar; the White Album Ensemble, a popular Beatles cover band and local favorite, covering Beatles music that was never performed live; Melody of China from the Bay Area, performing soothing nature music with traditional Chinese instruments; the trio Brocelïande, bringing Celtic music from the British Isles and Medieval and Renaissance music of the European courts and countryside to the mountain; Ancient Future, a world fusion music group featuring Arabic and Latin tunes; and the Stanford-based jazz trio Charged Particles, blending jazz with elements of Latin music, funk, classical, and other genres. The science speakers are experts in their fields and will provide fascinating insights into the universe as we know it and the current state of research in their respective fields of study. The Music of the Spheres concert series gives the public a rare glimpse of the observatory at night. Each event features a musical performance, an astronomy lecture by a scientist, and a history presentation about Lick Observatory’s rich past. Afterward, guests take turns viewing celestial objects through the 36-inch Great Refractor and the 40-inch Nickel Reflector. Guests have additional opportunities to stargaze with small ground telescopes provided by amateur astronomers. General, preferred, and VIP tickets will be available. For additional details and ticket information, please visit www.ucolick.org/summer/index.html. The Evenings with the Stars program also gives the public a chance to view through the 36-inch Great Lick Refractor and the 40-inch Nickel Reflector. Similar to the Music of the Spheres events (without the concert), each program features an astronomy lecture by a star scientist and a history presentation. Amateur astronomers also set up ground telescopes outside so that guests can get additional telescope time. Our new expert-guided "behind the scenes" style four- to six-hour walking tour of Lick Observatory will take the visitor on a tour of many sights, domes, and telescopes on Mount Hamilton. Participants can learn about the unique history of the world’s first permanently occupied mountaintop observatory, the eccentric California pioneer James Lick, technology used for observing on different telescopes along the tour route, and current science being conducted at Lick Observatory. After dark and weather permitting, viewing celestial objects through the historic 36-inch Great Refractor telescope will commence. Friday, May 4th, 6:00 p.m.
Sunday, May 6th, 6:00 p.m.
Sunday, May 20th, 6:00 p.m.
Thursday, May 31st, 6:00 p.m.
Sunday, June 3rd, 6:30 p.m.
Sunday, June 17th, 6:30 p.m.
Thursday, June 28th, 6:30 p.m.
Sunday, July 1st, 6:30 p.m.
Thursday, July 12th, 6:30 p.m.
Sunday, July 15th, 6:30 p.m.
Thursday, July 26th, 6:30 p.m.
Sunday, July 29th, 6:30 p.m.
Thursday, August 9th, 6:30 p.m.
Thursday, August 23rd, 6:00 p.m.
Sunday, August 26th, 6:00 p.m.
Thursday, September 6th, 6:00 p.m.
Sunday, September 9th, 6:00 p.m.
Thursday, September 20th, 5:30 p.m.
Sunday, September 23rd, 5:30 p.m.
Tickets for the Public Evening Tours and the Summer Series will go on sale to the general public at noon on Wednesday, April 18, at www.ucsctickets.com. Lick Observatory is located on the summit of Mt. Hamilton in the Diablo Range east of San Jose. Driving time from San Jose is about one hour via Mount Hamilton Road. Founded in 1888, Lick Observatory is at the forefront of astronomical research as an active research facility. It is operated by the University of California Observatories (UCO), a multi-campus research unit that serves eight UC campuses and is headquartered at UC Santa Cruz. More information is available online at www.ucolick.org. Please note: Weather may restrict telescope viewings, but other activities will still take place. Due to historic construction of the telescope domes, the 36-inch Great Refractor and the 40-inch Nickel Telescope are not wheelchair accessible at this time. Children must be at least 8 years of age for admission. Due to late hours the program may be difficult for children under 12. “Music of the Spheres” is for ages 12 and over only. More information is available online at www.ucolick.org/summer/index.html.